Get a sense of the local culture at Cape Schanck Lighthouse and Art Gallery of Ballarat. Get some historical perspective at William Ricketts Sanctuary and Barwon Park. 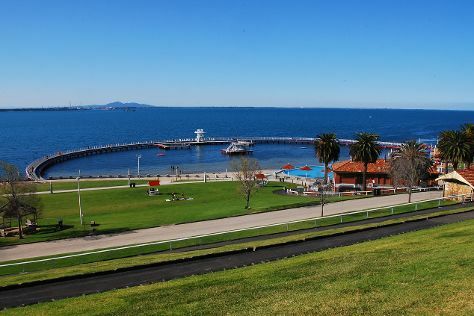 Change things up with these side-trips from Melbourne: Eastern Beach Reserve (in Geelong), Bells Beach (in Torquay) and Lake Wendouree (in Ballarat). Spend the 17th (Wed) exploring nature at Castlemaine Diggings National Heritage Park. Spend the 22nd (Mon) exploring nature at Point Nepean National Park. The adventure continues: identify plant and animal life at Phillip Island Wildlife Park, take in the views from Redesdale Bridge, learn about all things military at RAAC Memorial and Army Tank Museum, and admire the masterpieces at ArtVo. To see where to stay, ratings, photos, and other tourist information, you can read our Melbourne road trip planning site . If you are flying in from Hong Kong, the closest major airport is Melbourne International Airport. In April, daily temperatures in Melbourne can reach 23°C, while at night they dip to 11°C. Cap off your sightseeing on the 23rd (Tue) early enough to travel back home.